Following Part 1. A Discovery At Christmas and Part 2. Christmas On The Moor, this is the concluding piece in a series of three short memoirs, revealing the contents of a locked box that my father carried his whole life and telling the story it contained, which I discovered after his death. 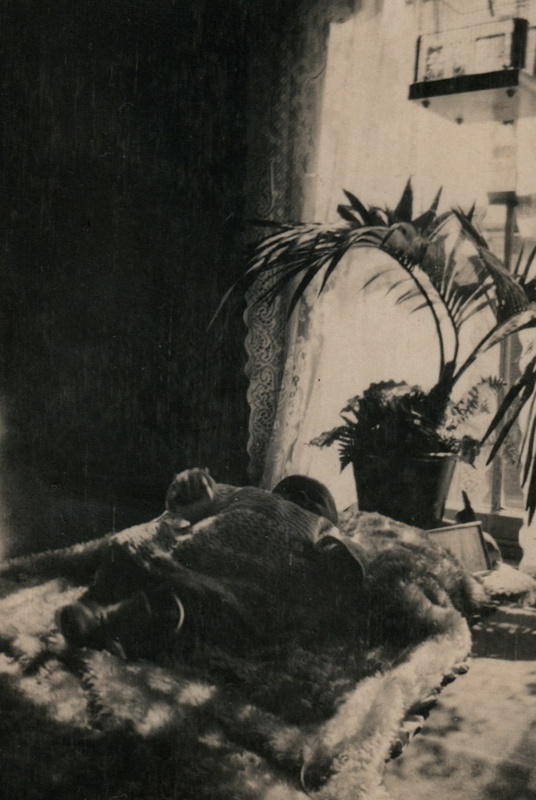 This is the only photograph of my grandmother, Gwladys Brown, and my father, Peter, yet even in this image – taken in Exeter in 1924 – she appears to be fading like a ghost, just as she vanished from his life and from the world after he had been adopted. I only learnt of her existence in 2001 when I opened a locked box after my father died and discovered a dozen of her letters which revealed she was a single mother who had been forced to give him up as a baby. 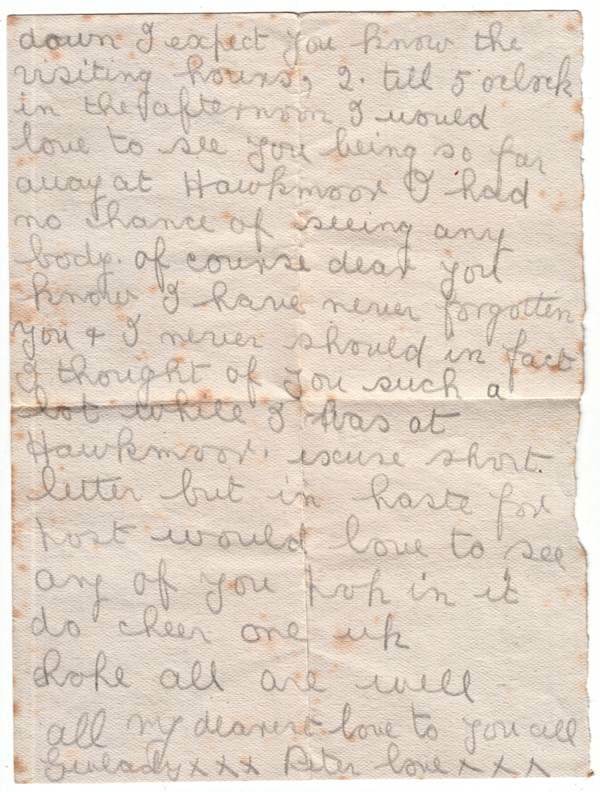 These letters comprise Gwladys’ account of the unravelling of her life – my father’s adoption and her confinement in a tuberculosis sanatorium on Dartmoor for ten months. Only one subsequent letter exists, written on the day she was discharged to a nursing home, suggesting that the treatment at the sanatorium was ineffective and, in the absence of any further correspondence or information, I can only conclude that she died there. 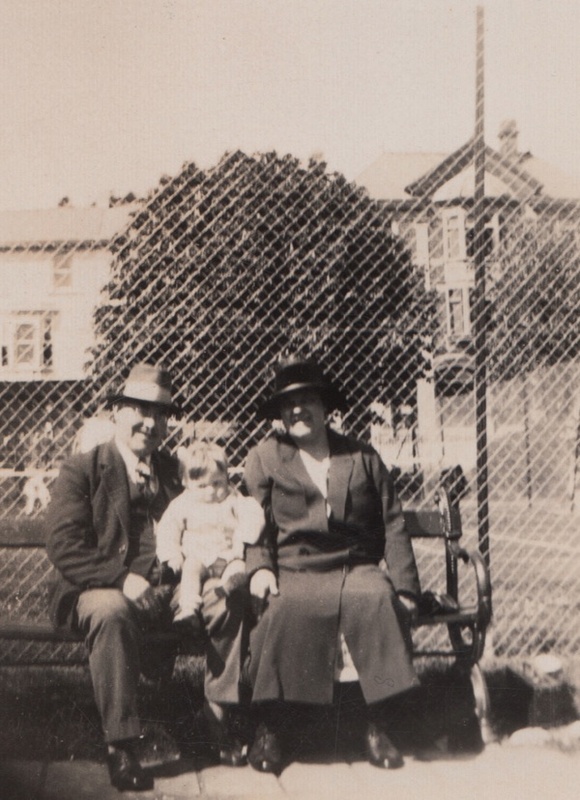 Looking back over the correspondence, I am puzzled at how Gwladys found herself alone and without any family or relatives in the small cathedral city of Exeter. Just as the father of her child was unidentified, she seemed to have sprung from nowhere. How fortunate she was to have the support of my adoptive grandmother, Edith, an entrepreneurial middle-aged woman who ran a fish and chip shop and rented out her yard for bicycle storage to the crowds visiting the local football ground. 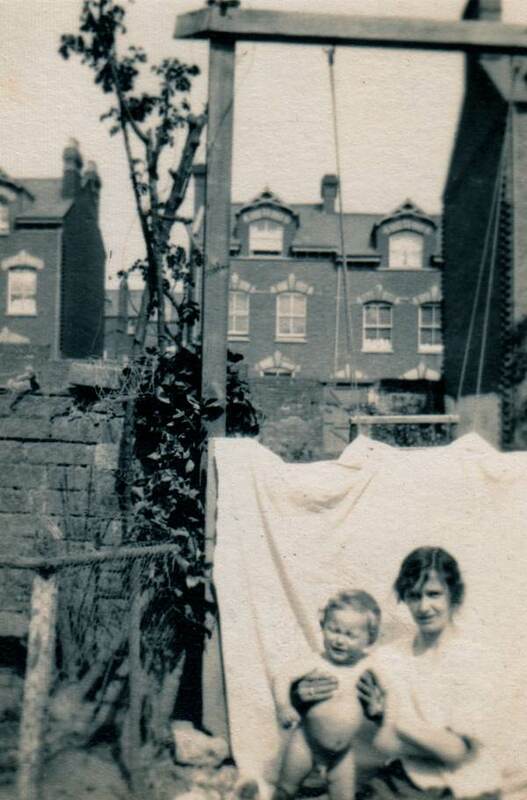 With her husband, a newspaper seller and rent collector, they adopted my father and – perhaps as an attempt to put the tragedy behind them – moved from a terrace in the city centre to a new house in a small estate along the river, where my father grew up. 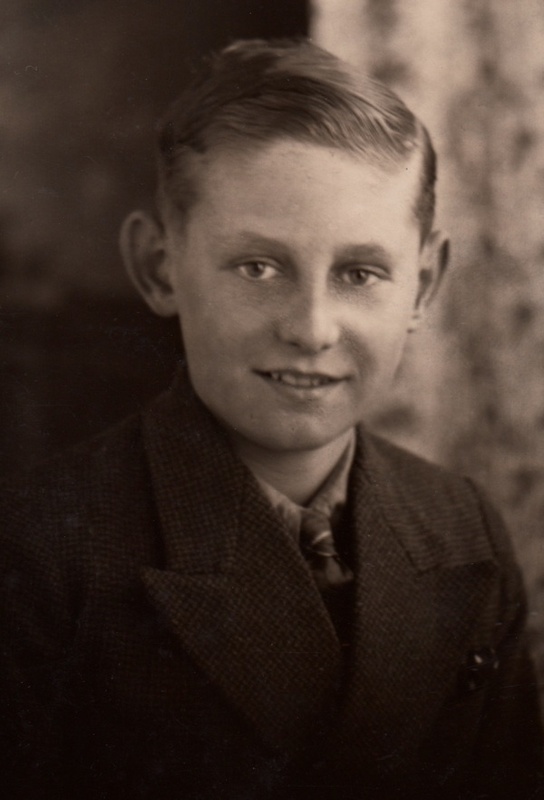 Accompanying the letters in the box was Peter’s birth certificate with the official truth spelled out, confirming Gwladys Brown as his mother and without any name listed for his father. Peter was too young to understand what happened to him when he was given up and it seems unlikely he had any memory of his mother. He used to tell me about the poor children with no shoes that he saw in the street when he was a child. It was a memory that haunted him and I think he was relieved that he had been spared. The couple who adopted my father had a daughter of their own and my father used to take me to visit her on Sunday mornings when I was small child but, once I started preparatory school, these visits ceased and I never saw her again. I wonder if this was a deliberate separation between his old life and his new on his part. From the moment I was born, my name was put down for a private school and throughout my childhood my parents struggled to find the fees even at the reduced rate we paid, thanks to a means test that my father tolerated in silent humiliation. I realise now that my father worked his whole life to become middle-class and, though as an adolescent I found it embarrassing, I have come to appreciate the virtue in possessing the facility to take control of your life rather than existing at the mercy of circumstances, as my grandmother had done. 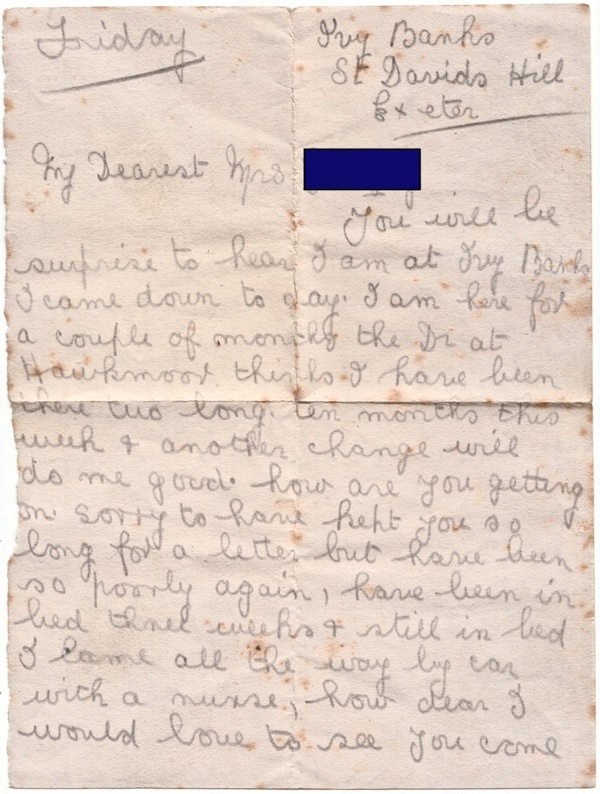 It was a matter of great shame to my father that, at eleven years old, he went to work in a foundry, yet he redressed this degradation through his prowess on the football pitch and whenever I walked through the city with him he was always greeted by fellow players who had become his lifelong friends. It was at the peak of his sporting success that he met my mother, an educated woman from a classy background. Her liberal mind and his social aspiration bound them together, yet also rendered them baffling to each other. The achievement of my university education fulfilled both their ambitions, even if my father was disturbed to witness the mental exertion of academic study close up. “You can only do your best,” he reassured me once, on discovering me in a delirious state of exhaustion, “I only want you to be able to do what you please in life.” I realise that much of who I am today came from the direction I was given by my father in reaction to that crisis of 1923. But, in his final years, he told me several times he was satisfied with his own life and its outcome, and I believe Gwladys would have been gratified to learn what became of her child. 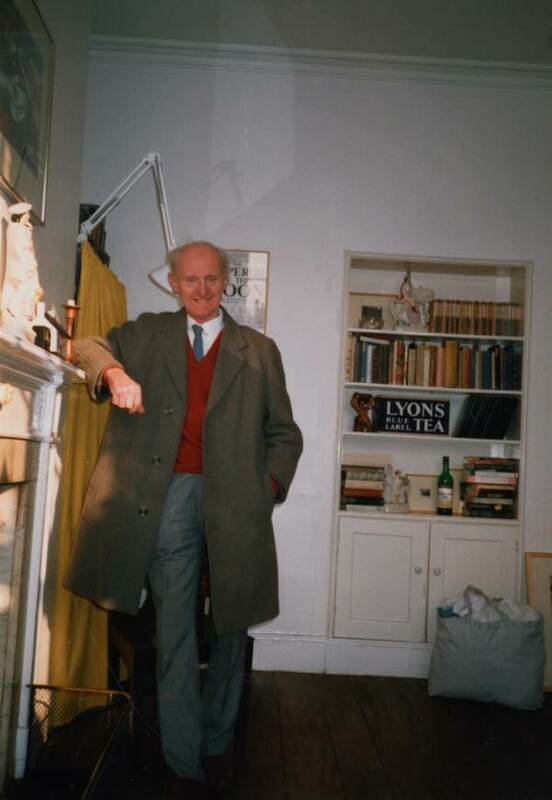 I often wonder when my father first read his mother’s letters and I think he made the box to contain them himself when he was a young man, as part of the process of fashioning his own world. 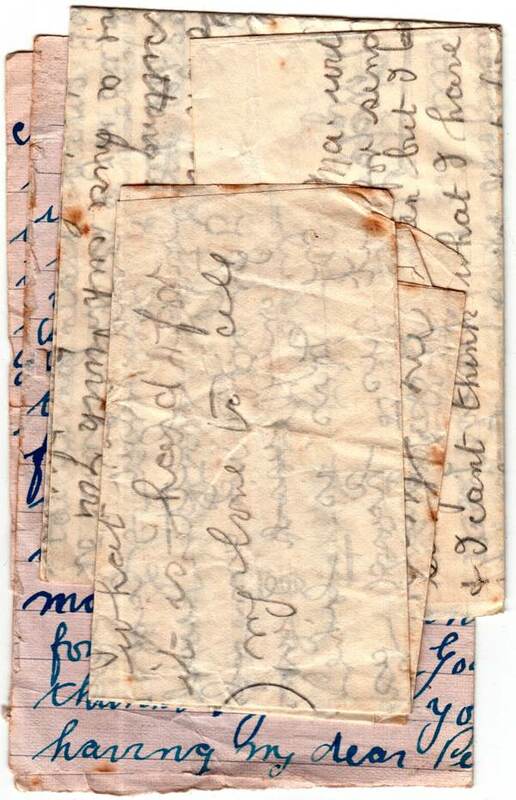 I believe he chose to preserve the letters and keep them safe his whole life as a tender remembrance of her. I have also kept all the letters and cards that my parents ever wrote to me and, now that both are dead, I cannot part with any of their missives. I understand why my father needed to keep his story secret and I deliberated whether to tell my mother, until I realised that if my father had wished to tell her then he had already done so. In the years prior to his death, she had suffered bouts of mental illness and his loss accelerated her confusion, so the question of whether to reveal the contents of the locked box quickly grew irrelevant. It was a lonely responsibility Peter carried but I believe the all-consuming drama of life took him away from sadness and grief. In a sense, he could ‘forget’ about the contents of his box, even if he could never destroy it. I like to think he kept it for me to find after he had gone. Dear GA, thank you for sharing the story and pictures. It is hard to understand the decisions of our parents, that they were of a time and place far distant from ourselves. I think that they would have liked the tender way that you revealed their story, perhaps it would have made the burden of the secret lighter. How moving and interesting. I know others with similar stories and though covered up at the time, should so be remembered. and by his child who honors him through his art. For it allows us to truly perceive the grand architecture of fate and the fruition of love. I’m sure he kept the box for you. How touching all of it. Lovely photographs of your family. Thank you for sharing the story with us. “I like to think he kept it for me to find after he had gone.” — I think that sums it up exactly. All the best to you and all in 2015! What fine people they all were …..Gwladys , Mr and Mrs xxxxx and your hard working parents . Love is what sees us through and they gave all they had . You have done them proud , a “gentle ” author indeed . Thank you for sharing this tender family story with us. Poor Gwladys, abused, overworked, and mistreated in a freezing sanatorium! The knowledge that dear little Peter was loved and safe must have been the greatest of comforts to her. The birth and death registers (indexes available online at freeBMD.com) will yield more information. Knowing where and approximately when she died, it should be easy to find the entry for her death, and then obtain the certificate, which will give her age. Once you know her age you can search for her birth certificate, which will give the names of her parents, your great-grandparents. There may have been more than one child born in the same time period and given the same name; if so, it will be necessary to trace each of them forward in time to see what became of them and eliminate those who were not your Gran. Good luck, and happy hunting! So many people died and buried in these places and forgotten as your grandmother was. My great great great aunt too here in America. Yes, thank you for sharing your tender family story. The tenderness with which you tell this story is remarkable – and appreciated. I’m sure, intrepid researcher that you are, you’ve found out what happened to the steadfast and loving Gwladys. You make me want to meet her again–in the continuation of this story. Yes, you were supposed to have that box, and write this story of love. Happy New Year! Thank you so much for your story. Our lives are such intricate, deep things, more than anyone (sometimes even ourselves will ever know) will ever realize. I so enjoy your blog posts and read every one. I live in Canada but love that I can see your home through your eyes. It is a privilege. Thank you. Mrs. X, known as “dear” in the letters from Gladwys, was your grandmother, and Mr. X your grandfather, right? Did you know them, your father’s adopted parents? I wonder what happened to their letters to Gladwys. Is Gladwys a Welsh name? A beautiful story! I’ve been wondering what to do with all the letters I have carefully filed and preserved over the years. You’ve restored my belief in the importance of keeping correspondence as historical artifacts and records. The difference between life and fiction is that life does not often yield happy endings. If the life of Gwladys had been written by Dickens she would have ended up in a cottage given by a benefactor. True life was that she finished her days in a nursing home and probably lies in a paupers grave. She has however left her mark in history, your good self, so her living was not in vain. Maybe with your great knowledge of researching the internet you might be able to find her grave and arrange for a little thank-you tribute to be left. If this is not possible why not plant a commemorative plant in your garden to keep her in your thoughts. Thank-you for sharing this story. Thank you for a thoughtful and illuminating insight into your history. Thank you for sharing this very moving story. Best Wishes. This was the perfect story for Christmas. And it was all about love. How hard they all strove to do the right thing so one little boy could grow up. How much his absent father lost. More fool him. 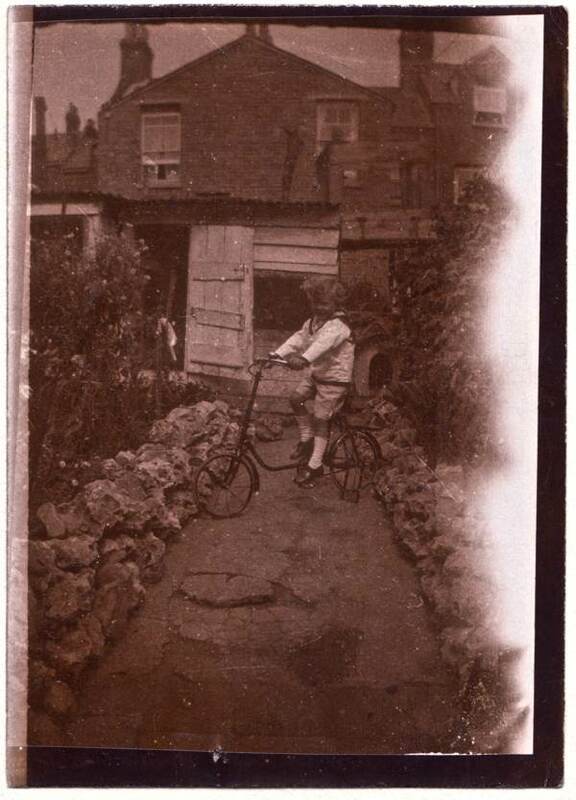 Those photos – in long-lost back gardens – are so redolent of the times and so very touching. Your grandmother was a striking woman and brave. The way she covers her left hand with a ring-bearing right and stares right down the lens, head up, immaculately dressed…Some people would say this was about shame but it wasn’t – it was about responsibility right to the end. I’m sure the box was left for you. You look like your handsome father. Such a lovingly told story and so moving. I lived right by the football grounds on Oxford Rd in Exeter at the end of the 80s, and can readily picture the city center terraces, the fish and chip shop, and your grandmother’s back yard full of bicycles during matches. (What an enterprising idea.) But as with all your stories your words are enough to bring them to life. I’m so glad to have met you this past year. Thank you for all you do. I read the third instalment just past midnight on New Year’s Day when the fireworks were still sounding out across London and there were peals of laughter on the street below. All the more profound to read about Gwladys’ fate then, as I was waiting on news as to whether a lifetime friend of mine would make it through the night after having been admitted to hospital with a stroke. The photo of poor Gwladys holding her son was so very poignant, and the transformation from the beautiful girl she was just a few years before was shocking. What a doubly cruel blow for her with choice being removed twice, firstly by the convention of the time and secondly by her illness. Even if she had been able to keep her son, it seems likely that she would not have known him beyond infancy given her health predicament. Perhaps, at least she would have ended her days at Ivy Banks in the quiet knowledge that your father was safe and being cared for well. Perhaps too there was someone looking after her, as she would surely have needed to have met the fees for her sanatorium stay, given it was before the days of free healthcare. Thank you for sharing your story, you have caused so many of us to think more deeply about circumstances. how heroically your grandmother fought for herself and her child. how heroically he fought for you. and how heroically you have worked to make this city and its people and its ghosts stay alive for us. thank you, gwladys. So very moving. It makes me think of the story of my great grandmother. Widowed young, her youngest child born out of wedlock. 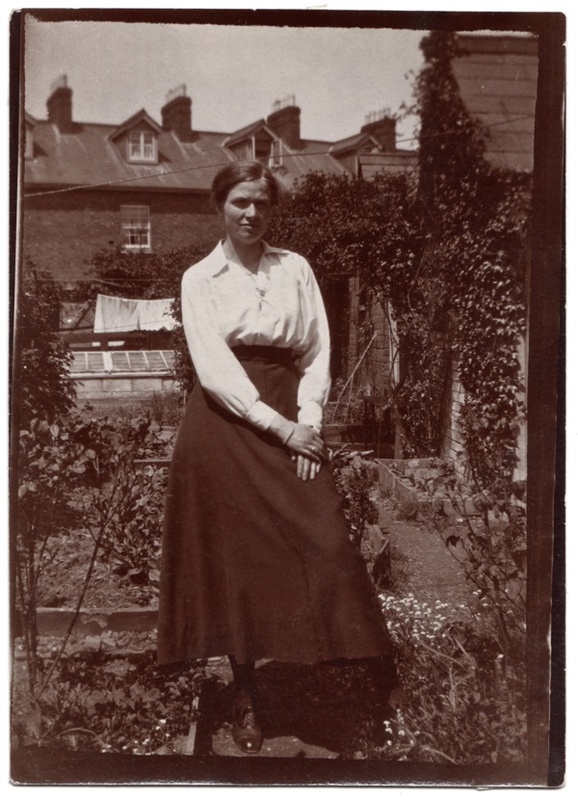 Just after the first world war, she took her two younger daughters to Australia, leaving the elder one, who was working and ‘courting’ behind. The story does not end happily. Bullied by her sister-in-law: my grandmother recalled her mother being burned on the arm with an iron. Soon Rachel became ill. A couple of years later, she died from cancer. My grandmother and great aunt decided to return home with only a handful of photographs and a lock of Rachel’s hair to remind them of their other misadventure. Returning home was quite an adventure, however, with exciting rickshaw rides through Singapore and an board romance for Great Aunt Edna. My grandmother had lifelong issues with her kidneys after becoming dehydrated in the Australian heat. Back in the damp, cold north-west of England, she married a miner, who contracted a nasty flu virus in the 1930s which left him disabled. My grandmother worked full time while her husband looked after my mother. A non-smoker, my grandmother died aged 68 in 1968 from lung cancer triggered, perhaps, from working in the carding room in a cotton mill or from pouring liquid explosive material into bombs as a munitions worker in World War II. The narratives of our forebears are important and should not be forgotten but will be if we fail to tell our children, if we have them, or fail write them down. And even then, the stories of their lives will vanish as if they had never been. Joy and sorrow blown away like dust from our hands.